This specific character is part of Universe 3001, a campaign setting created by writeups.org contributor Chris. I liked the character of Powerpax from X-Force Annual 1, who I’d forgotten about until Pufnstuff wrote her up. I also enjoyed New Mutants #49, which showed an elderly Katie Power in possession of all the Power Pack abilities. 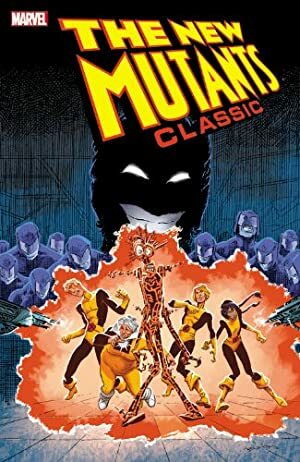 These two characters, and Puf’s writeup, inspired me to include Power Pack descendants as minor legacy heroes in my timeline. I’ve made some changes to the Powerpax stats as envisioned by Puf (who nevertheless rates as co-author since this writeup is only an adaptation of his). A few changes were made simply to bring her powers up to LSH levels. The “quote” here is a correction to the canonical Powerpax’s quote “mass down…strength up…Powerpax bullet, rippin’ through!” Powerpax actually has no power to change her mass or strength; instead she changes her density by raising or lowering her volume. She can spread her mass out, lowering her density and becoming gas-like. Or she can concentrate her mass, shrinking into a dense, mouse-sized person. Real Name: Francine “Frankie” Power. Known Relatives: Katie Power (distant, many “greats” great-grandmother), Gravity Kid (aka Tel Vole, distant cousin). Base Of Operations: Legion Academy at Montauk Point, Metropolis, 31st century Earth. Height: 5’ Weight: 85 lbs Age: 12. Powerpax has all of the powers of the original 20th century Power Pack. She controls her own molecular density by changing her volume. She can reduce her size while maintaining her body mass (compacting that mass into a tiny package), or increase her size without increasing her mass, becoming a cloudy, gaseous figure (in DC Heroes RPG terms, Shrinking, Density Increase, Self-linked Fog, Fluid Form). She also has the power to absorb radiant energy (Energy Absorption), as well as the energies binding molecules together. The latter means she can disintegrate matter with a touch (Disintegration). Powerpax can release this absorbed energy in the form of energy ball projectiles (Energy Blast). Her power over acceleration allows her to fly (currently at about twice the speed of sound). This leaves a rainbow-colored trail of Speed Force energy behind her. In addition to Flight, she can channel this Speed Force energy internally, increasing her reflexes and reaction time (Superspeed). Finally, she can increase or decrease the gravitational pull on herself and other people/objects that she touches (Gravity Increase, Gravity Decrease). Powerpax makes use of some inventive combinations of these four abilities to maximize her combat effectiveness. Her Legion Academy training has focused on this area in her solo training sessions. So far she’s mastered four special techniques. For the “Powerpax Bullet” she shrinks to her minimum size, compacting her mass and achieving her maximum density and physical toughness. Then she flies at full speed into (usually through) her target, using herself as a deadly projectile weapon. That can destroy an armored vehicle and could probably render a normal person into splatter-patterns on the landscape. The “Rainbow Express” is a handy maneuver combining her cloud form, her flying power, and her gravity powers. Becoming a cloud, she encompasses a group of people (teammates, bystanders, etc. ), degravitizes them, and pushes them along via her Flight power. As a “Stuncloud”, Francine has a very effective way of immobilizing groups of enemies. In cloud form she encompasses a group of foes, thereby touching each of them, and increases gravity for everyone she’s touching. Anyone in the cloud becomes superheavy. Finally, she’s developed a “Deathcloud” maneuver (so far only used in solo training sessions vs. mechanicals). This combines her cloud form with her disintegration touch. She becomes a cloudy mass disintegrating things within it. Most attacks pass harmlessly through her gaseous substance and energy attacks are absorbed. As she disintegrates more mass and absorbs more energy the entire cloud glows, throwing off power balls of excess energy to KO foes outside the cloud. Her teachers continue to push her to find new combinations. A trick they’ve suggested which she may (or may not) manage in the future is to try rechanneling absorbed energy. She might be able to use it to amp her Flight speed or strengthen her anti-grav fields, rather than simply firing an energy ball. Francine Power is reputedly directly descended from Katie Power. Power was one of the fabled Power Pack and a hero of the 21st century Eugenics Wars which precipitated World War IV. Like Katie, Francine possesses all the powers of the four original Power Pack members (control over gravity, acceleration, density, or energy). Many records from the 21st — 25th centuries are lost. But according to family tradition, Katie was the only one of the original four Power Pack children to survive the Eugenics Wars. At least some of Katie’s siblings survived long enough to become parents. Thus, there are at least two other family groups around which claim descent from the Power family. One of those other branches, the Vole family, occasionally produces a descendant with one of the Power Pack abilities. This is most often the gravity powers. Francine’s branch of the family is the only one which can be verified to have produced a handful of descendants with access to all four of the Power Pack abilities. One of these was a player in the 26th century defeat of the Canaanite Lord Apocalypse during World War VI. Another participated in the interstellar Great Wars of the 28th century. 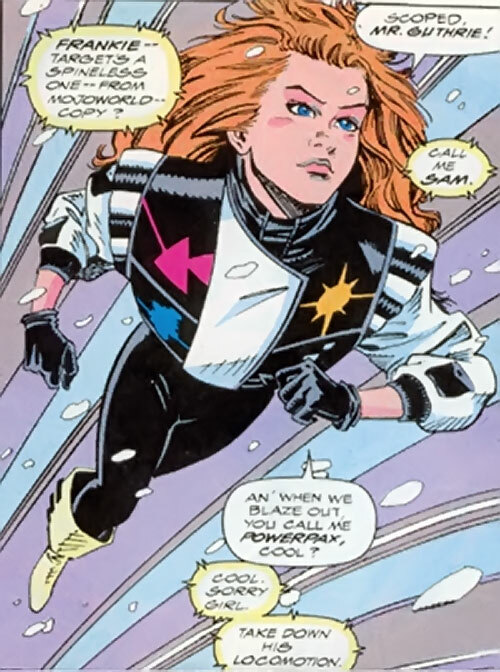 Other descendants of Katie, according to anecdotal accounts from the family, have been known to manifest one or more Power Pack abilities during a crisis. They then have the powers go dormant again. Every few generations one is born who shows one or more powers from childhood. But less than ten in the last thousand years have shown all four powers, as Francine does. The family speculates that because the original bequest of power from the Kymellian Aelfyre Whitemane was intended “to save the world”, the powers manifest most strongly during times of great need. This rather unscientific notion is scoffed at by the Vole family (which has never manifested more than one power at a time). But it is very nearly an article of faith among most of Katie’s descendants. She has enrolled at the Legion Academy in hopes of reviving the family legacy. She’s still undecided as to whether she wants to eventually join the Legion or to try and make a name for herself as a solo hero. For now, as she’s only 12 years old and only provisionally allowed to attend the Legion Academy, it’s not a decision she worries about. She won’t be eligible to try out for the Legion until she’s at least 14. Her distant cousin Tel Vole (aka Gravity Kid), also enrolled at the Legion Academy. He is 17 and plans to try-out for the Legion before his next birthday. As he possesses only the gravity powers, his prospective membership would not be a barrier to Francine despite the Legion Constitution’s duplication of powers clause. This does not mean, of course, that there is no rivalry between the two Power Pack descendants. Francine is rather childishly gleeful about being more powerful than her older cousin. For his part, Gravity Kid rolls his eyes at Francine’s “grandiose” claims about her destiny. Yet he can’t help feeling a little self-conscious about being shown up by a 12 year old. So far, though, their teachers deem the rivalry to be useful. Francine’s creativity in combining her powers has been spurred on by her desire to show up Tel. And Tel has responded by learning to use the gravity powers more effectively than any since Alex Power’s solo career as Gravity in the late 20th and early 21st century. Powerpax is a small girl, slightly built with stawberry blond hair, freckles, and a serious disposition. Powerpax is quick and bright. She loves adventure and shows confidence and competence beyond her years. At least when she is not trying to annoy her cousin Gravity Kid with her “anything you can do, I can do better” attitude. Aside from this she has a generally serious disposition. She’s cheerful, but she’s convinced she’s meant to save the world, and works hard at getting the most from her lessons. She shows a knack for coming up with useful combinations of her powers. She quickly understands what her teachers at the Academy ask of her and she does her best in all her lessons. In training sessions, Powerpax specializes in fast-attack combat and point recon. This is a strange position for a child her age, but her powers and personality are well-suited to it. Disintegration has a Range of Touch (+0) and has no continuing effect (-1), but RAPs fuel Power Reserve (+3). Energy Absorption is Derived from Disintegration (-1). RAPs fuel Power Reserve (+3). Energy Blast is Derived from Disintegration (-1) and uses DEX for AV (+0). Flash is Derived from Disintegration (-1) and provides Steady Illumination only (-2). Power Reserve Must Be Fueled by Disintegration or Energy Absorption (-4, BC 100). At least 1 AP of Power Reserve must be assigned to Flash before any can be assigned to Energy Blast (-1). Fluid Form is Derived from Self-Link (Fog) (-1), can only be used in fog form (-1), and is Always On in fog form. Shrinking is Derived from Density Increase (-1), and does not affect her STR or weight (+0). Density Increase is Only Usable with Shrinking (-1), 1 AP of Density Increase activated for every 2 APs of Shrinking in use. APs of Density Increase do not subtract from Dex (+2) or add to weight (+1). Gravity Increase has a Range of Touch (-1) and is Derived from Gravity Decrease (-1). Gravity Decrease has a Range of Touch (-1) and is Derived from Gravity Increase (-1). Flight leaves a rainbow trail (+0), and is not reduced by Shrinking (+0). Superspeed surrounds Frankie with a rainbow aura, leaves a rainbow trail when running, and is Derived from Flight (-1). It takes a Dice Action to activate Superspeed, which kicks in at the very beginning of the next Phase (early enough to affect Initiative). Her basic Initiative thus doesn’t include the Superspeed Bonus (-1). Connections (Legion Academy, Low), Insta-Change, Scholar (Computers). Uncertainty, Young (age 12), Public Identity, Misc;: body mass is 1 AP. LSH FLIGHT RING As a Legion Academy student, Powerpax is occasionally given a Flight Ring for the purposes of a training mission. It is not a normal part of her equipment. Using her Flight as EV for a Charging attack and Superspeed to sub for DEX, she Shrinks to minimum size, which gives her maximum protection from her Density Increase. The result is a punishing Physical attack (AV 09/EV 11). A combination of Flight, Fog form, and Gravity Decrease. Becoming a cloud, she encompasses a group of people (teammates, bystanders, etc. ), degravitizes them, and pushes them along via her Flight power. A combination of Self-Link Fog and Gravity Increase. In cloud form she encompasses a group of foes, thereby touching each of them, and increases gravity for everyone she’s touching. A potentially lethal maneuver combines her cloud form (Self-linked Fog) with Disintegration. She becomes a cloudy mass disintegrating things within it. Most attacks pass harmlessly through her gaseous substance (Fluid Form) and energy attacks are absorbed (Energy Absorption, Power Reserve). As she disintegrates more mass and absorbs more energy the entire cloud glows (Flash), throwing off power balls of excess energy (Energy Blast) to KO foes outside the cloud. The use of Power Reserve more closely mimics my take on the original Power Pack abilities, esp. Katie’s ability to become super-energized by Thor and Beta Ray Bill and muster more raw power than an Asgardian Thunder god! She probably should have Bishop’s Energy Funnel schtick for that sort of thing. But I decided to keep it simple — if she needs a mega-powerful Energy Blast, she’ll have to Push Power Reserve to get it. By Chris Cottingham with Pufnstuff. Helper(s): Pufnstuff’s writeup of the canonical Powerpax from X-Force Annual #1, Gareth Lewis, Azrael.